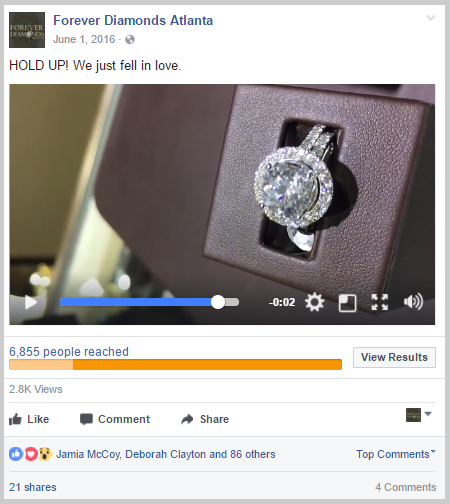 In this social media management case study, you’re going to see how we helped boost brand awareness for 3 unique businesses. The first example comes from a brand with a line of all-natural beauty products. We generated 54,874 total fans. As you can see, we are widely known for our social media marketing services. So much, in fact, other marketing agencies often refer business owners to us who are looking for great social media campaigns. After a few initial meetings and careful thought, Taliah decided to proceed forward with us. Today, we’re going to share how we helped Taliah, and other clients, build brand awareness through social media management. But first (for the newbies) let’s take a look at the benefits of social media management. In 2017, Statista reported that 81% of the US population (2.34 billion) actively use a social network. According to Adweek, people tend to spend nearly 2 hours a day on social media platforms. This means it is likely your customers or target audiences are on a popular social media platform. And your business is able to reach them… potentially every day. For any savvy business owner or marketer, this alone would be enough reason to use social media marketing for business. But here’s the icing on the cake. In 2017, social media is the most cost-effective marketing channels available today. Today, it is possible to reach, fan and engage the exact person within your target audience for as little as $1 in ads (live examples of this later). That’s right, $1. The same cost of a burger off the dollar menu. Now imagine if you had 1,000 people (fans) that followed your business, trusted you and took strong interests in your products/services. What if you had 2,000 fans? Or what if you had 54,874 fans like Taliah. And that is what this social media marketing case study is all about. What is the difference between social media management and social media advertising? Every marketing agency has their own opinion and thoughts of the difference between social media management and advertising. And honestly, there’s no right or wrong way to describe the two. Social media management is centered around a long-term strategy to generate more brand awareness. Typically, this means building up strong relationships with fans or potential customers over 6 – 12 months. Whereas social media advertising is centered around a short-term strategy to generate leads and sales. Typically, this means doing a direct response (click and buy) advertising campaign over 3 – 6 months. Check out our case study on how social media increase sales for a deeper understanding. However, the social media management approach is the most effective as you will develop a stronger connection with your audience. Social media management is like a long term relationship. Social media advertising is like a one night stand (with potential for more). Now let’s take a dive into results of Taliah’s social media management case study. Taliah was able to reach and engage her exact target audience for less than $1. Here’s a screenshot from their ads manager showing 0.16 per fan. Here’s a look at the $.01 cost per view. (The cost per view is a lot more effective and cost efficient than traditional TV network advertising). Here’s a look at the $.004 engagement cost. It is safe to say that whatever we did worked, right? It’s not as simple as many people may think. This is was the result of careful planning and past experiences. Every business is different and targets a different audience. The core principles of social media marketing… grabbing a prospect’s attention and building a relationship… remains the same. We know this because we’ve implemented the same successful approach for more than 278 clients. Would give you a golden opportunity to be there first. Otherwise, it makes strategic sense to study the behaviors of your competitors and customers prior to launching any social media campaign. A careful look at competitors social media posts, growth and ads is good starting point to see what is working and what is not working. When researching customers we put together a customer avatar. The purpose of the customer avatar is to have a framework for the ideal customer’s goals, values, pain points, challenges, sources of information, objections and more. Goals and values: What does the customer want from himself? Family? Friends? Pain points and challenges: What is the customer frustrated with? What prevents the customer from reaching their goals? Sources of information: This is info about where your ideal customer is hanging out online. What blogs are they reading? What conferences do they attend? Objections to the sale: Why would the target audience say no to your product? Is it time? Cost? Difficulty to use? Lack of perceived value? This information allows us to put together a content strategy that will speak directly to that audience. This is key to grabbing and keep the target audience’s attention. Usually, once the research is done amateurs dive straight into managing their social media campaign. After research, we begin to work on a content calendar. This content will shed light on what posts we are creating, on what days and why. It helps make the process transparent for everyone and works towards a consistent model of social media publishing. In addition, we begin to map out a growth strategy. This usually explains which tactics we will employ in order to build the fans and followers of the brand. This is what our clients like the most. Week 1: Team Kickoff Call and Setup. Usually.. this is not true. Most people give up too quickly or don’t know how to measure their progress. Even if the business is in a narrow lane, you can still create advantages with social retargeting audiences (pro tip). Therefore, the major key to success in digital marketing is tracking and measurement! Social media is a very complex marketing channel. That is why you MUST track your results against your goals. In addition, we give our client’s access to a custom social media system that allows them to keep up with the progress 24/7… with the ability tracking every single interaction point. LYFE strives to improve results month over month. Every team member is dedicated to generating results to help our clients grow. We study the report and look for ways to optimize/improve for the next month. For example, if find that educational posts are performing the best then we will spend more time to create educational posts. The goal of this phase is to make sure we are aware of what’s working and to optimize towards those things to improve results. Forever Diamonds is a jewelry company located in Georgia’s Lenox Mall. The owner, Malik, was looking for ways to grow his store’s awareness in the huge mall. After only one call, Malik identified that LYFE was the company he trusted and we launched his social media management campaign. As you can see again, Malik was able to reach and engage his fans for less than $1. But what Malik was really happy about was the 39 Pre-Owned Rolex Watch Offer Claims. 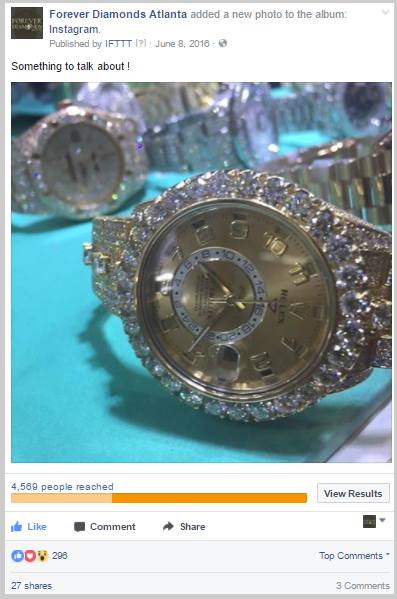 This basically means 39 people set up an appointment and made a commitment to visit the store to buy a pre-owned Rolex.. 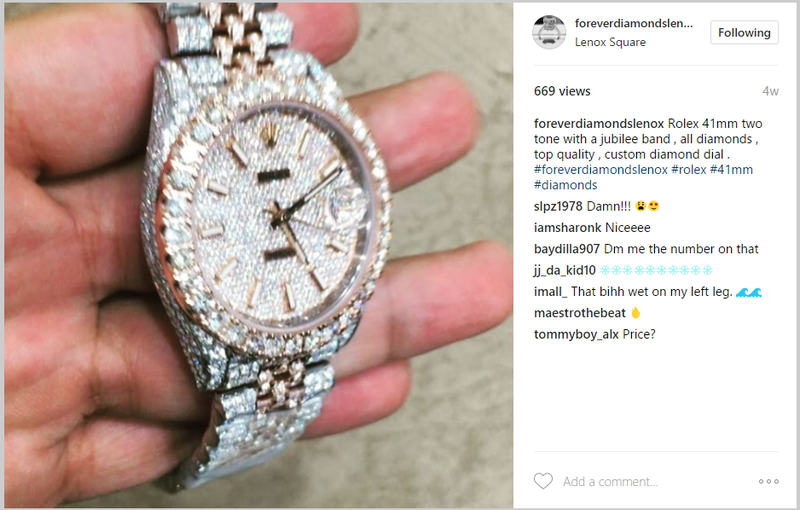 In 2017, Forever Diamonds continues to grow their brand awareness that ultimately drives more foot traffic and new customers. Some of you heard about Jacob’s sales success in our SEO results case study. Jacob helps run an automotive snow company. He used all our services in generated over 98K in sales within a 5 month period. A big part of Jacob’s success was the social media marketing component. As you can see again, Jacob was able to reach his fans for under $1. In fact, under $.25 cents! Jacob was able to achieve these results in under 5 months with our services! The big key here is their advertising budget. During these 5 months, Jacob spent over $18,241.55. Which equates to a little bit over $3,000 per month in advertising spend. A price they were more than happy with considering the revenue generated. Social media management is a long-term business decision (6-12 months). The core benefit of social media management is building up awareness and engagement. Which ultimately builds strong relationships with fans which influence their buying decisions. Of course, we recommend hiring us if you want to use an experienced team with a proven strategy that works. Show up for your “get to know you” call with one of our sales consultants.